The Benham class was an improved Bagley and similar Gridley Class Destroyers. The primary difference was in the funnel trunking. The Benham had a lower more compact trunking arrangement. The Benham's were armed with four 5" 38 cal guns with the forward two being in enclosed mounts. They had a heavy torpedo armament with four quad mounts. 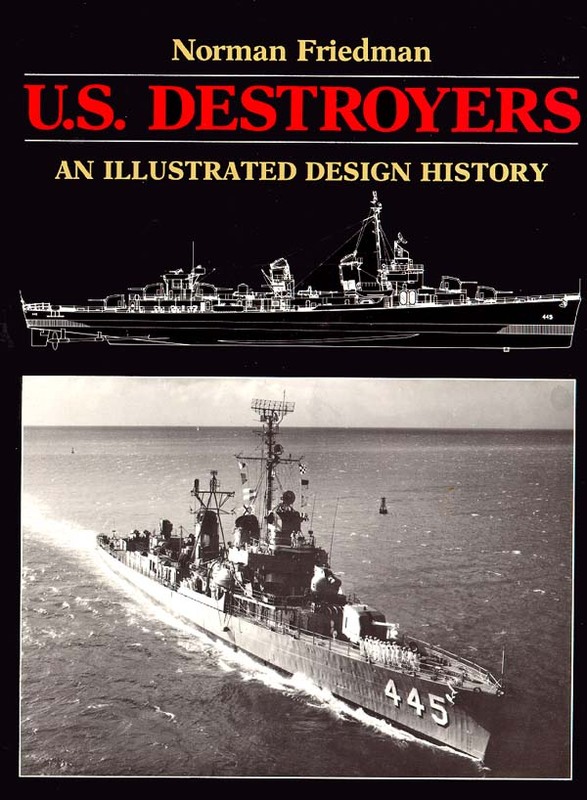 This class of ship was active in both the Atlantic and Pacific Oceans during the war. 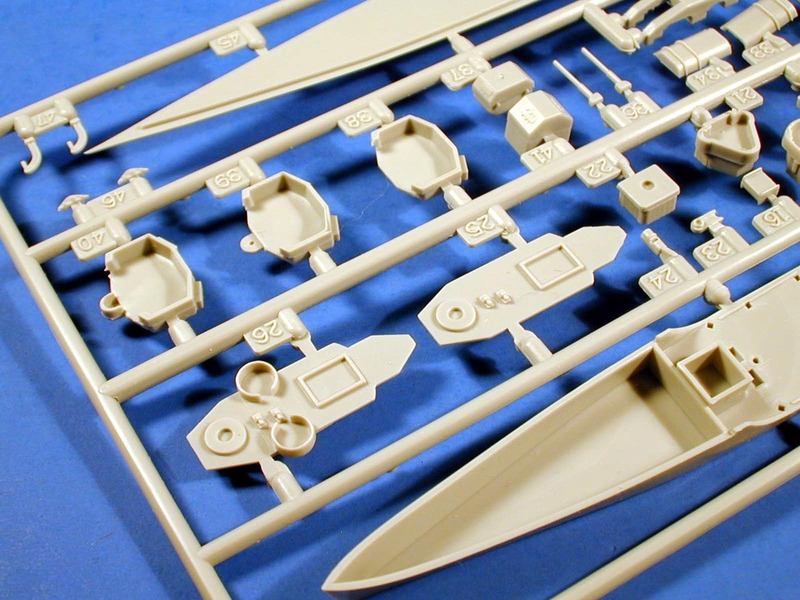 Midship Models a new line of ships from Chris Decker of Trident Hobbies has produced a completely new line of waterline ships. This one, the USS Stack represents a mid war Benham class but can easily be converted to prewar or even late war versions of any of the Benham class destroyers. 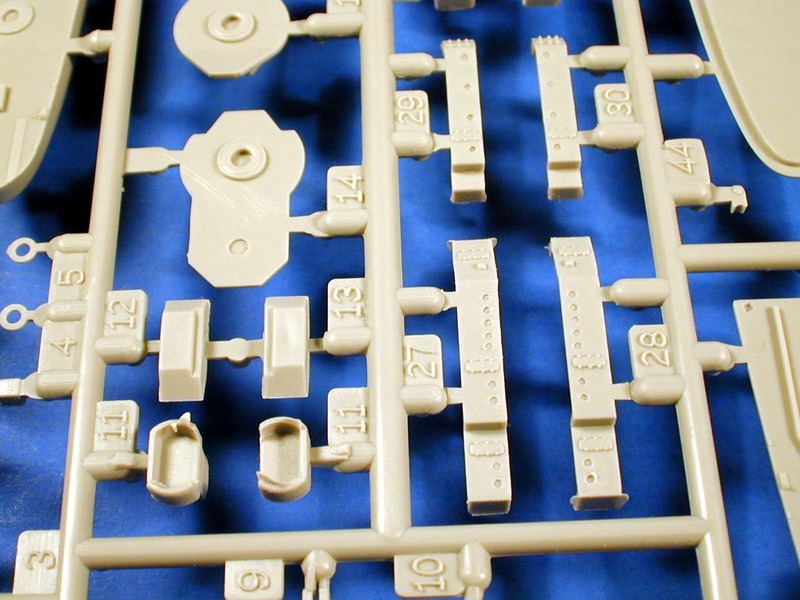 The superstructure parts have nicely detailed doors with visible latch details. The port holes are pretty well done but not completely open. The splinter shields are a little on the heavy side. 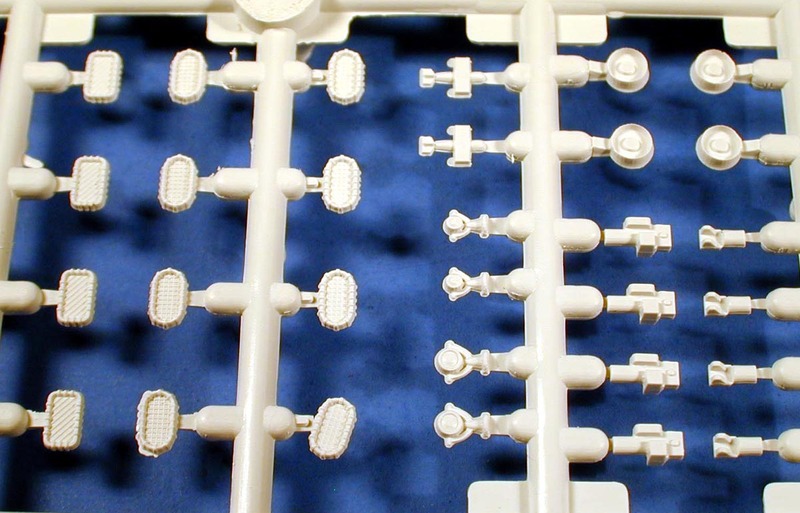 The funnel trunking is molded without the fairing typically found on these ships. This shouldn't be a problem to fix with a bit of sheet plastic and some putty. The funnel itself will need some additional work as the Benham class had an oval shape not the flat sided ones included in the kit. Also missing is the distinct square to oval transition at the base. 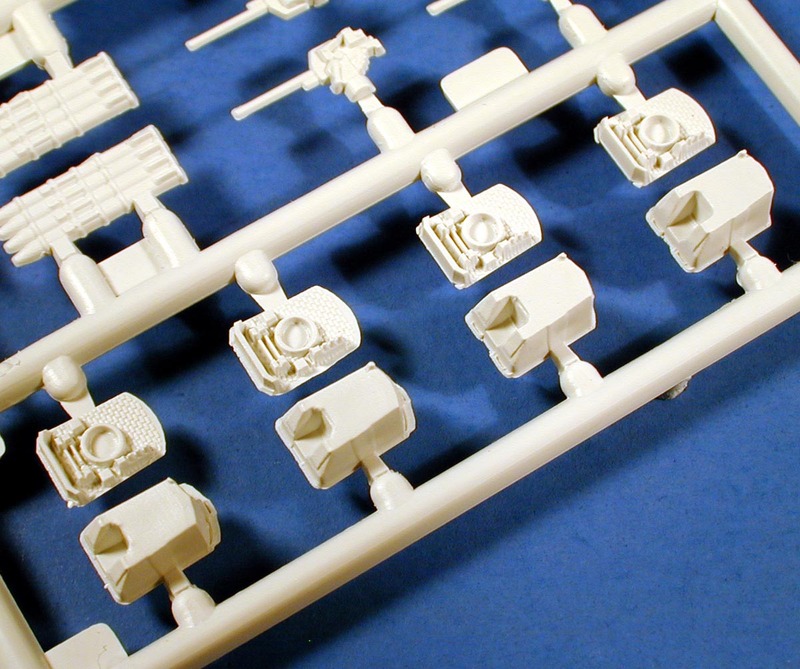 Some of the parts have some heavy sink marks due to their thick sections, but nothing the average modeler can't fix. 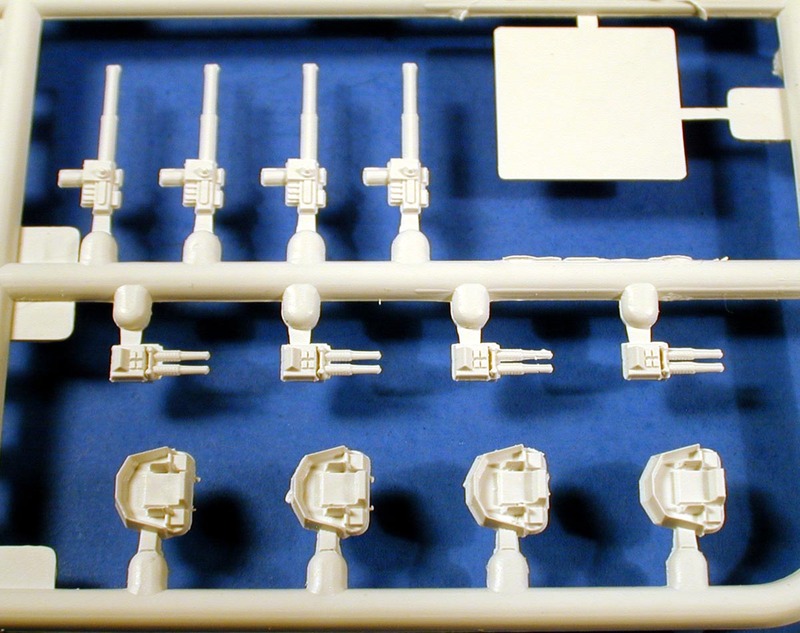 Some items like the mast are very thinly molded. 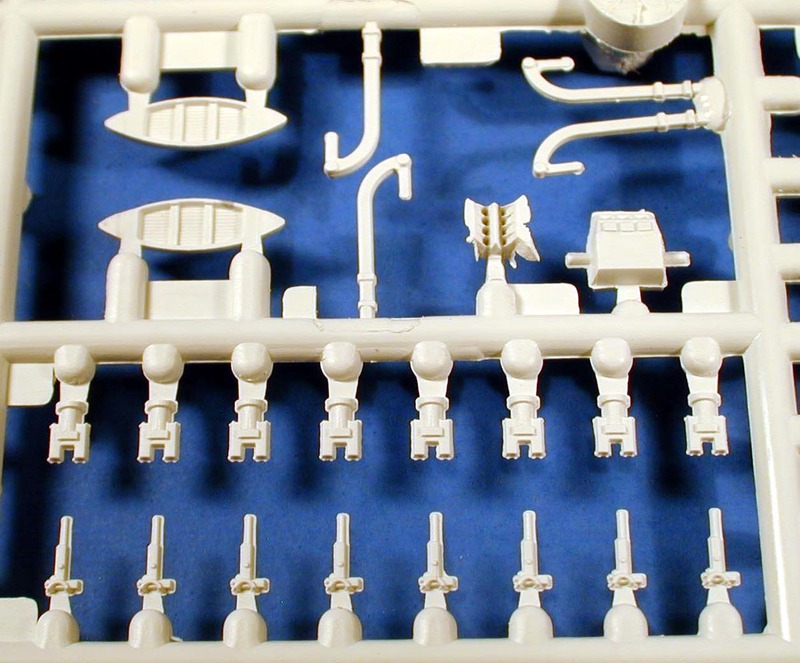 The kit includes include enough parts to do several versions of the Benham or even a Bagley class. There are three different bridge configurations possible with two different forward and aft deck house versions possible. 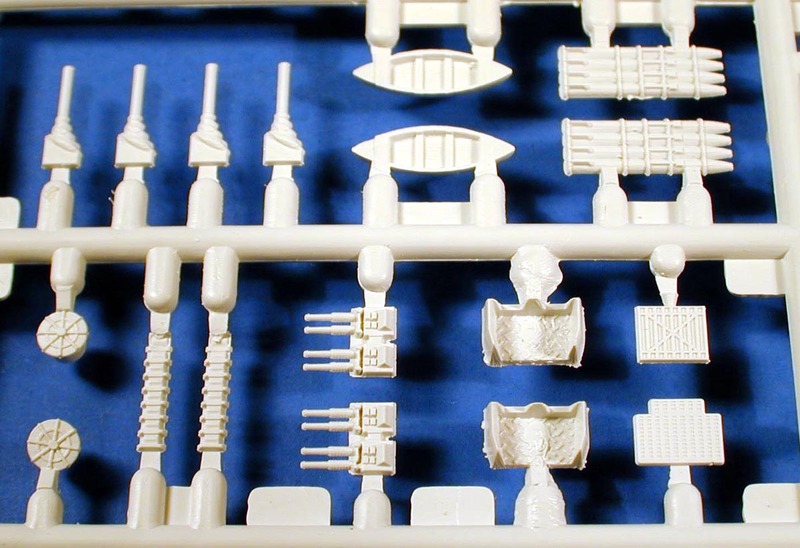 The weapons sprue is similar to the Skywave E-6 set. 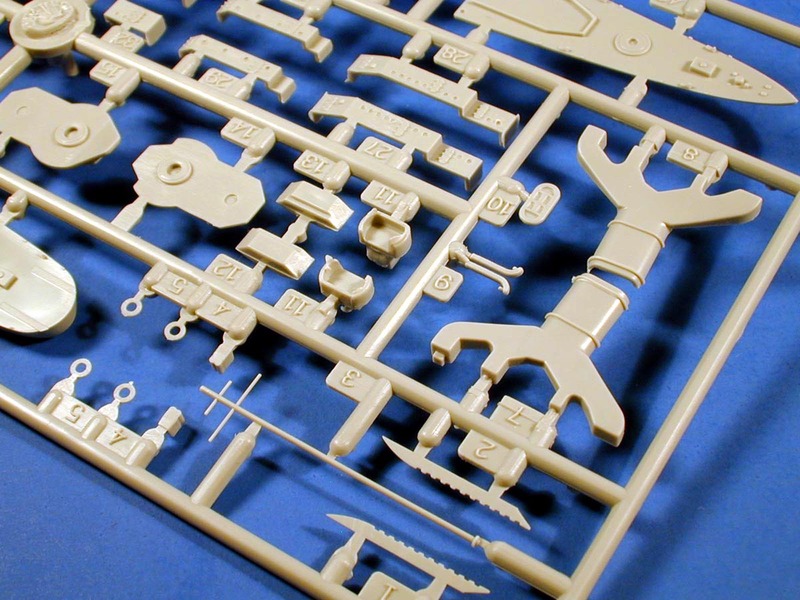 There is everything you need to build a Benham class as well as a bunch of extra spare parts you can use for other projects. 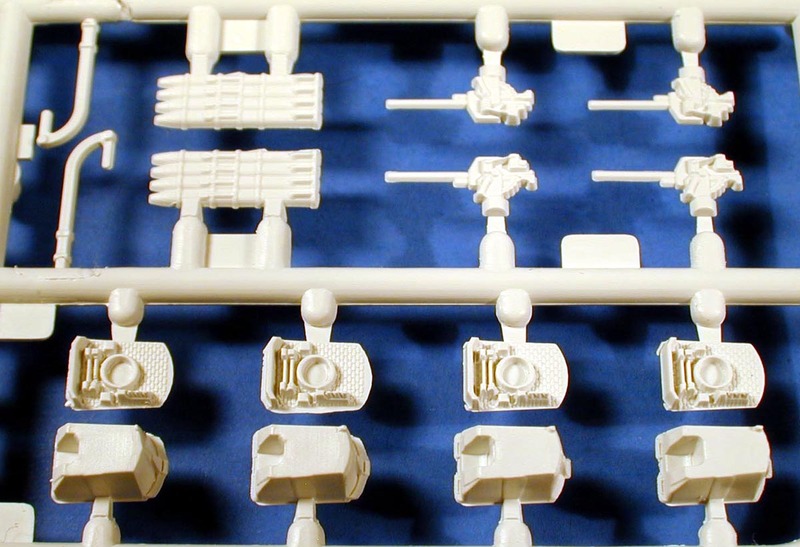 The parts have a bit of flash on them and vary in quality and accuracy. The 5" open mounts look very good but the enclosed mounts need quite a bit of work. The sides of a real 5" 38 cal gun house are vertical but these are tapered and the gun mounting slot is twice as large as it needs to be. You might be able to sand these down to make them look more accurate. 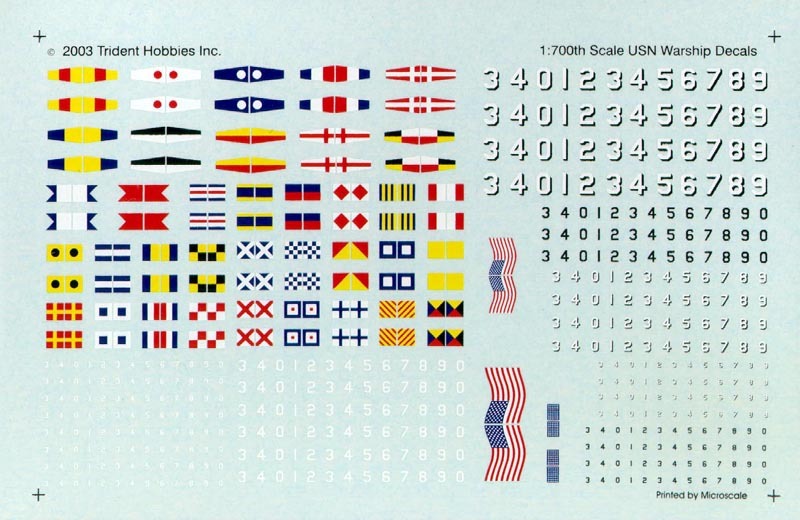 The decal sheet includes flags and pennants as well as both prewar and early and late war hull numbers. 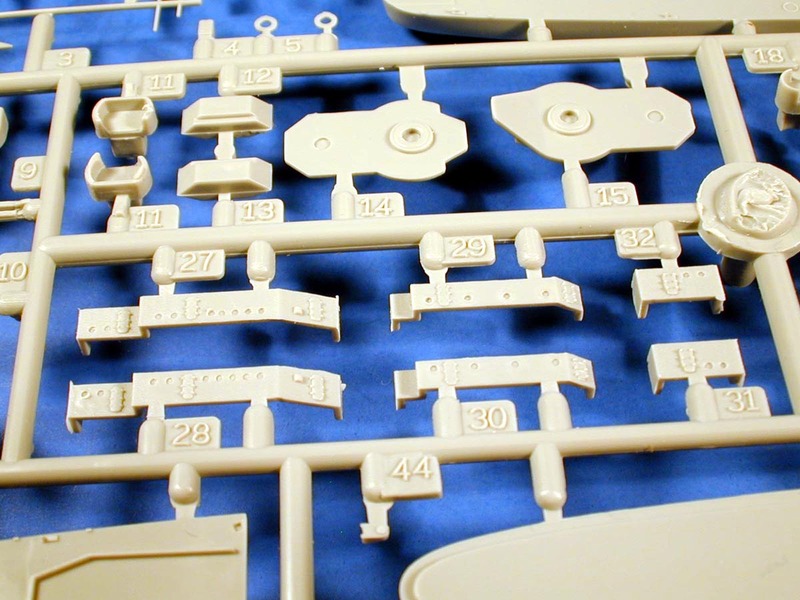 These are printed by Microscale and are typical of the high quality decals they usually produce. They are nicely registered and sharp. The instructions are nicely done on an A-size sheet. 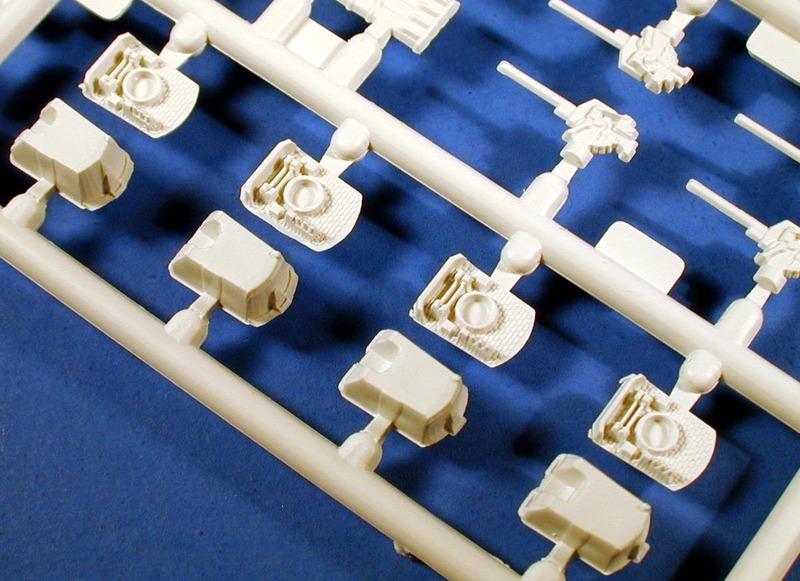 Page 1 includes a color profile with Model Master and White Ensign Colorcoats paint equivalents. The color profile is however so dark it is hard to make anything out on it. 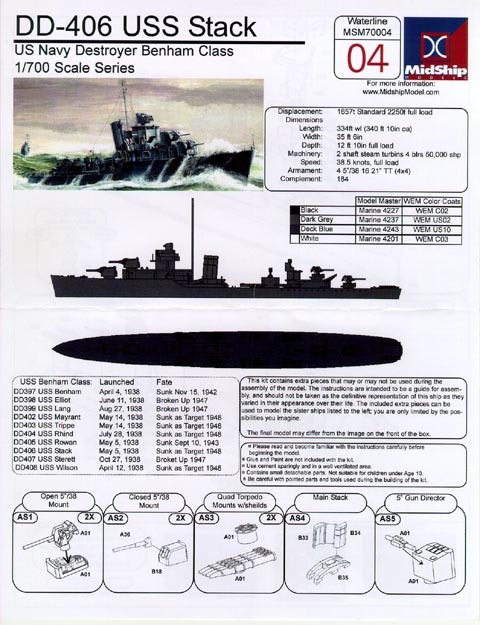 A class list and specs of the ship are included as well. 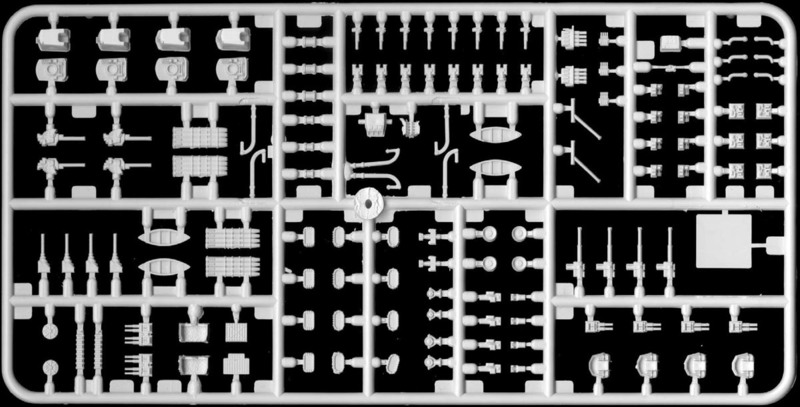 Some basic subassemblies are shown on the first page as well. 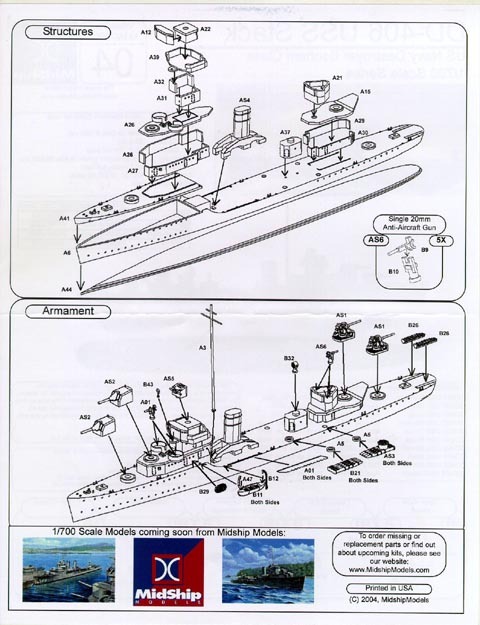 The main hull assembly is shown on page 2. These are all you really need to build the ship out of the box. If you plan to superdetail yours, then you probably have already lined up additional resources. It's good to have a new line of ships on the market. Especially one with so many build options. A lot of thought went into the design of this kit. I am however disappointed with some of the errors in the parts. Having said that I know that this is pretty good for a first kit, and the next ones will be even better. 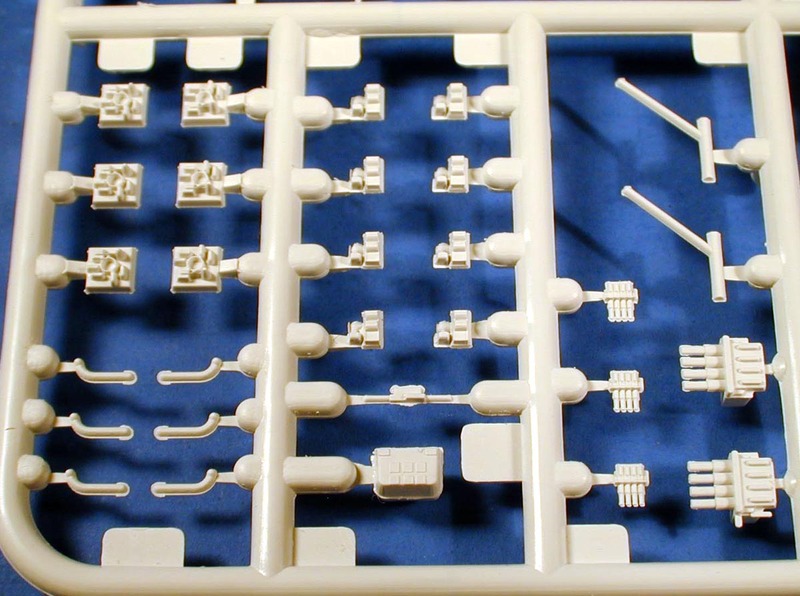 This kit will provide a good base on which to produce a whole bunch of ships that have not been available in some time time. 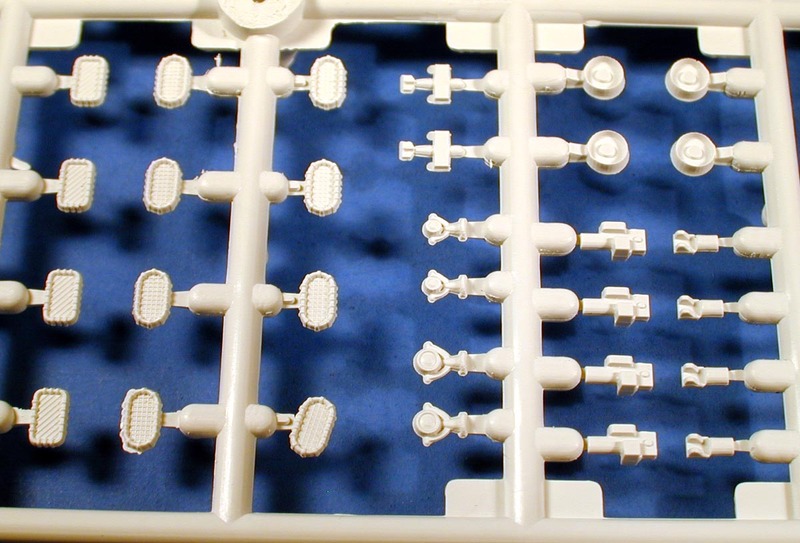 Order yours now for $19.99 on the Trident Hobbies online website.